Delhi-based visual artist Shelly Jyoti is showing over thirty textile-based artworks - using Ajrakh printing and dyeing along with needlework on Khadi canvases - that demystify ideas of Swaraj and Swadharma. The exhibition includes four new textile site-specific installations, 30 new Ajrakh artworks on khadi, multimedia spoken word poetry and short film on making of Swaraj and collectiveness. 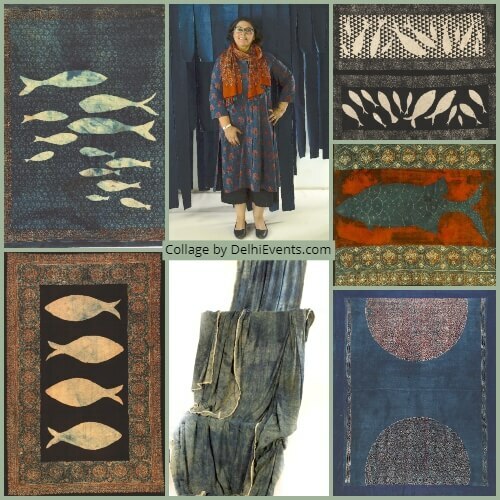 Jyoti has been drawn to the Gandhian philosophies of Swadharma and Swaraj since her very first solo titled Indigo Narratives in 2009 and has continued to explore these themes through Salt:The Great March in 2013 and The Khadi March: Just Five Meters held in 2016. The works in the current show, therefore, are inspired by Gandhi’s seminal anti-imperialist text Hind Swaraj written in 1909. This exhibition examines elements of Gandhi’s critique of modern civilisation, noting his emphasis on an evolved ethical and spiritual self for creating an alternative perspective of a better world. To bring social revolutions for creating peaceful societies, the idea of self-rule or self-control needs to be experienced uniquely by each individual. Individuals who have harnessed their inner strength can move mountains. In a twelve-piece wall-mounted installation work titled Lunar Swell: Swaraj, Sarvodya, Swadharma (Ajrakh printing, dyeing, piecing and needle work), Jyoti is inspired by the powerful moon that orbits the earth, changing appearance due to its position in relation to the earth and sun. “The moon changes its structure after every 29 days and its cycle of repetition. To me, this crescent moon that has a powerful allure, beauty, legend and myth has a timeless quality. The idea of Swaraj is timeless, whether it was Gandhi’s narration of Hind Swaraj critiquing western modernity, or Tilak’s famous quote’ Swaraj is my birth right’ or Swami Vivekananda referring to Swaraj as internal awakening during Arya Samaj movement in early 20th century. Although without alluding to the specific historicity of events, Swaraj and Swadharma seem eternal and embedded in time. A large 36x50 inch work titled Lunar Swell: A Dusk Moment & Terminator (ajrakh printing and dyeing on khadi) depicts theboundary between the illuminated and darkened hemispheres. Gandhi wrote Hind Swaraj with the backdrop of 20th century events like World War 1, the Holocaust, Stalin’s repressive regime, Pol Pot’s genocide, atrocities in the name of religion, repression of individual freedom in the name of fundamentalism and much more. That was his transient moment of understanding where modern civilization was heading for, and Hind Swaraj was conceived in this background as a critique of European /western modernity. Another captivating series of 20 ajrakh scrolls is titled the Fish series, inspired by micro-organisms in water, such as trillions of tiny fish collaborating together, displacing water to create oceanic currents, waves and turbulence in undersea environment. Through this, Jyoti examines the idea of ‘collectiveness’ and ‘collective impact’ that can bring about social change with evolved and spiritually self-aware communities. Shelly Jyoti is a visual artist, fashion designer, poet and an independent curator. Her work focuses on Gandhi’s ideology of nation building for creating moral and peaceful societies, relevant for 21st century, connecting past with the present. She works with various media, excavating from colonial history and celebrating the subaltern. She is trained as a fashion designer from National Institute of Fashion Technology, New Delhi, and she earned her MA in English Literature from Punjab University, Chandigarh.